False lashes add glamour to your look and enhance your physical appeal. Fake lashes continue to evolve and every year, new fashionable trends emerge. The current fad in the world of false eyelashes is the lashes extension and bolder strip lash styles. Recently, eye lashes extension was introduced into the market and many lashes enthusiasts, including celebrities are embracing the new trend. False eyelashes extension and bolder false lash styles are among the top 10 fashion trend for 2016. Celebrities like Kim Kardashian, Katy Perry, Rihanna, and many other Holly A-Listers have contributed in no small way to the surge in sale being experienced by false lashes. What makes lash extensions and bold false lashes so trending right now? One of the reasons for this is the various bold and voluminous look false eyelashes can create in a breeze by makeup artists for phenomenal photo ready effects for all makeup looks. That is where it nicks it and it has become an instant hit among beauty conscious women. Also, they are utterly simple to apply, perfect to add that extra touch to make the eyes pop. For those who don’t have the time or patience to apply false eyelashes every day, lash extensions can offer an easy solution. Eyelash extensions are an easy way to extend the length and thickness of your natural eyelashes. Lash extensions require no regular application and removal of a set of sticky fake lashes night after night. These extensions can be applied easily within two hours and could last the whole duration of two months that your natural eyelashes grow and fall out. However, they need to be regularly cared for and eyelashes technicians could help with this with periodic refills. What is the benefit of these extensions? Well, they add variety to any set of lashes you use. These extensions come in various sizes and lengths. They could be made of synthetic, mink, or silk. The lighter mink lash extensions are more expensive than the other types. No doubt, you want your false lashes extension to last throughout the duration of natural growth circle. Therefore, you should ensure you keep water away from your lashes for the first 12 to 24 hours after application. This is because water can weaken the adhesive before it gets properly dried/cured and it could cause your lashes to fall off prematurely. Thereafter, what you should do to keep them in good condition will be determined by the type of glue you used. There are various types of adhesives for this purpose. In addition, try to avoid glue for sensitive eyes. Some oil-based products and makeup removers should not be used if you want your false lashes to stay in place for the duration of the natural lashes growth cycle. Using water-proof mascara on the eyelashes extensions should also be avoided because it is hard to remove and can make the lashes to drop off prematurely. When you want to beautify your eyes with lashes, always use professionals to fix them into place. Some people have seen their false lashes falling off. This is because they were not handled by experts. Fake lashes and the extensions done by a professional can last for 2 months and only fall off with your natural lashes. When a quack applies lashes, he applies one synthetic lash to more than one natural lashes. This can cause clumps or the lash to break and fall off. For those with steady hands who like to vary different shapes false lashes for different makeup look, false strip eyelashes are the perfect choice. Applying false lashes is not that difficult, all you need to know are these simple steps to follow to achieving that celebrity look you have always desired. There are inexpensive tricks for brightening your eyes for both day and a night out. The process begins with you selecting the right lashes for yourself. Purchase the right ones for your eyes’ shape and structure and then begin the process leading to a stunning look. We have some suggestions you can follow. Select the Right Ones You Like: Take into consideration the shape and structure of your eyes when selecting false lashes. Bear in mind that there are two main types of false lashes – individual lashes that is applied one at a time on top of your natural eyelashes and strip lashes that is applied all at once to your eyelid. If you choose individual lashes, it will take some time to finish with and could be a bit trickier to apply for lash newbies. However, the strip lashes provide you with a variety of choices from natural to head turn fuller, bolder look all along your lash line and it is easier to apply, especially if you have no prior experience. Spiky Style gives a retro, wide-eyed doll-like look. Look resembling Twiggy, but more doll-like. Criss-cross Style gives a natural glam effect. Nice for wide eyes and most eye shapes. They resemble natural full lashes and won’t appear super heavy or overdone. Dense/Fuller Style give a retro look like Twiggy. They can capture attention from afar. Full lashes naturally accentuate all eye shapes while giving a more dramatic look. Angles/Side-Sweep Style gives a cat-eye effect. These lashes often combine with other styles (often criss-cross, spikes and dense) to give unique attention added look. Natural/Sparse Style gives a very natural look, they add some fullness good for daily everyday wear. Double Layer Style give a more dramatic and bold effect. These lashes are unforgettable and showstopping but do appears to be fake on first impression. These lashes are perfect for photo shoot or runway catwalk to give that ultra glam look. If you are not sure which false lash style to choose, go with one with a shape and length similar to your natural eye shape and the look you are after. 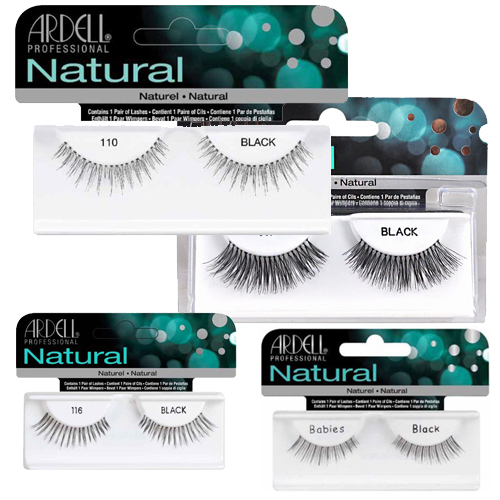 When in doubt, choose natural or criss-cross style lashes with medium length and rounded lash shape (such as Ardell#101 or Andrea #333). Lashes that have the most length in the middle of the eyelash strip create an universally flattering shape and look. For slightly glamorous yet natural look, medium length criss-cross style false lashes (such as Ardell or Kiss KPE33) with a wispy design to give a textured and voluminous look throughout. Cut the Lashes to Fit: The strip lashes are just one length and before you use it, you need to cut them to fit the size of your eye. After you cut them and without glue on them, hold the lashes up to your lash line. When you are done, trim them to fit perfectly. Use Good Adhesive: Use proper adhesive for your eyelashes. Though, glue come with the lashes, it may be best to buy a quality eyelash glue to assure quality ingredients are used if the false eyelash adhesive is an unknown brand. Always choose adhesive that dries clear and that is strong for a natural look and all day hold. Alternatively, select dark adhesive that dries black for stunning “eyeliner” effect. Dark adhesive also helps conceal the false lash band. If you Use a thin strip to each of the lash band and wait for few seconds for the glue to dry and become tacky. After this, affix the false lashes to your lash line on the upper eye lid and press with gentle firmness to put into place. When you follow the simple steps above, your lashes look will be amazing. Fixing your false lashes into place does not take that long to complete and repeated use will perfect your skill like a pro. It is possible to reuse false lashes with proper cleaning and storage, but it is best to get new set of falsies lashes after first use if you get messy oil-based mascara or eyeliner over them. Remember to remove the lashes gently from the eyes. In one hand, hold the lashes gently but firmly between your forefinger and thumb. With the other hand, pull at the lash glue residue until it begins to come away..
Next place the lashes on the tissues and gently hold the lash band with your fingers, just enough to stop it from moving around. Next, tip a cotton swap into isopropyl alcohol or an water based eye makeup remover, then move the head of the swap from side to side over the lash band to remove any trace of mascara and/or eyeliner residues. When no more makeup residue is coming off, your falsies lashes are totally clean for storage. Once your false lashes are dry, place the lashes back onto the half moon of the plastic lash tray and press the lash band gently against the tray to restore the lash band curvaturel. lastly, snap shut the lash tray to keep the eyelashes secure for next use.n shape.